Kepco's sealed KHX power supply modules are ideal for harsh or unusual environments such as railroad /mass transit, military, marine, mining and industrial applications. KHX’s fault-tolerant design improves availability, eliminating single-points of failure and hot swap capability means no system downtime for maintenance. They are well suited to meet the frequent wash-down and sanitizing requirements of the food and beverage industry. Modular design permits KHX to mesh with other Kepco models as part of an N+1 redundant system. Optional enhancements include distribution boxes, battery backup, status monitoring and compliance to all application classes of MIL-STD 461. KHX are designed to provide high availability DC power for applications where safety and reliability are a must. Perfect for extreme wet and hot environments. Outdoor rated enclosure NEMA type 3; 3R; 4; 6 or IEC IP65/66/67/68/69. Submersible for flood prone tunnels per IP68 and NEMA6. Withstand high temperature (steam)/high pressure water-jets. Hot-swappable: no system downtime for maintenance. Suitable for undercarriage mount of railway cars; trucks or EV subject to frequent wash-downs per IP69K, water splash or flooding. Wineries; food and beverage facilities, subject to daily or constant cleaning per IP69 or IP69K. Can be used as Sensor power supply in underground application or submersible application. Designed to meet ABS (American Bureau of Shipping) requirement. Seismic-proof design complies with International Building Code and California/Alaska Building Code for Seismic reflection geophysics/geological exploration. Sealed design allows use in explosion-proof applications; e.g., power to LED lighting or any equipment in zone I class 2 for chemical/industrial/agricultural applications. Low brownout/AC/DC with Surge/EMI protection for power line input-sensitive or AC generator-run equipment, or input line redundancy make it ideal for lighting applications, e,g., replacing fluorescent designs with LED-based designs. 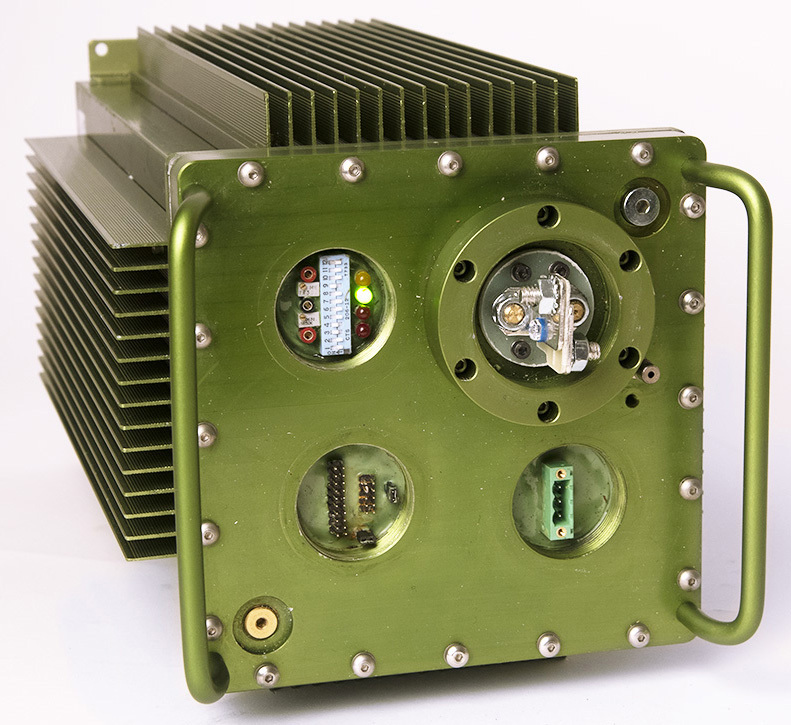 Meets EMC per EN 61000 and MIL-STD 461G (ground, Army). Ethernet Control, USB, I2C are available. Available mounting: wall mount, DIN rail (or similar), pole mount.